By Craig | April 18, 2019 | This post may contain affiliate links, which means we may receive a small commission, at no cost to you, if you make a purchase through a link. Read our Disclosure. 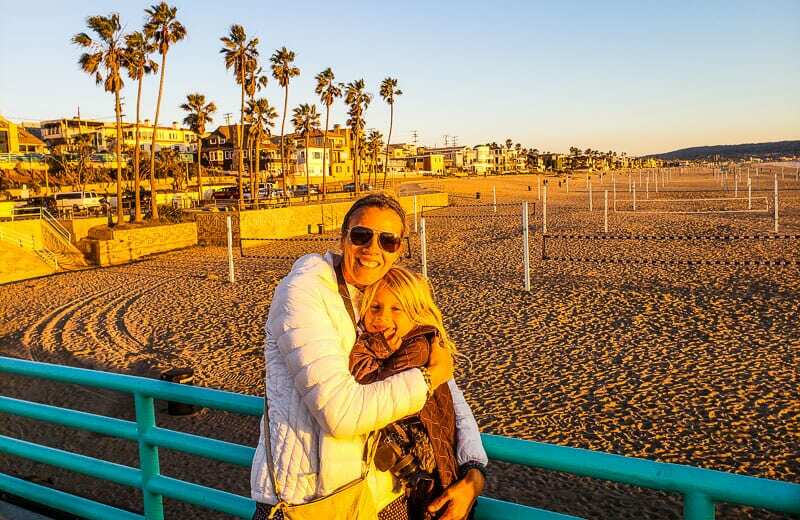 LA is the second biggest city in the USA, and as a visitor it seems like there are endless things to do in Los Angeles with kids! Over the years we’ve been able to visit Los Angeles several times. Firstly solo, then as a couple, and now with our two daughters, Kalyra and Savannah. To be honest we weren’t initially big fans, and it’s taken a while for LA to grow on us. Sometimes you have to visit a place a second or third time before you can appreciate it, especially one with a wide variety of things to see. Our opinion of Los Angeles was always that it was overrated, and the main reason to visit would be for a trip to Disneyland. Otherwise it was one big sprawl of a city with horrible traffic, average weather, expensive, and no real community or soul. And we could never understand why people would choose to live there? 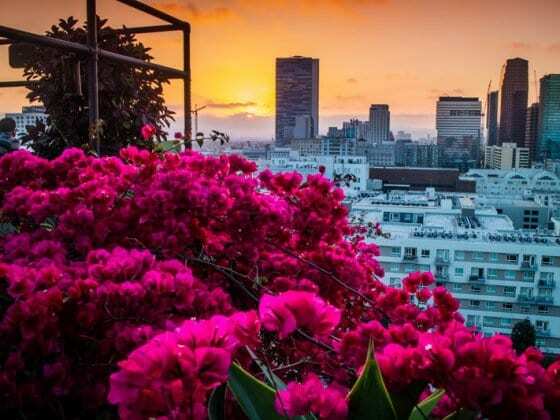 But on our recent visit on our one year USA road trip, we’ve finally discovered an appreciation for the City of Los Angeles and have found what people find so attractive about it. This visit we embraced the sprawling metropolis, got some great insider tips from locals we know that live there and from other family travelers. So this trip to LA just felt different. 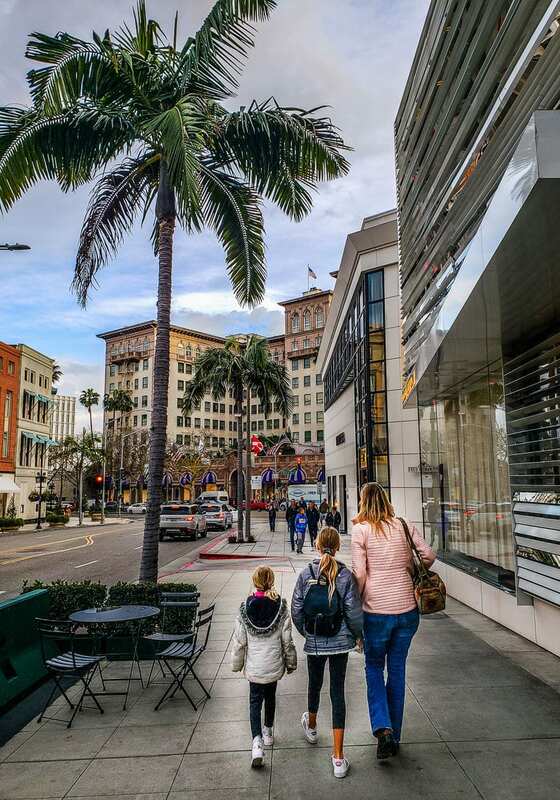 We had more time, which allowed us to explore at a slower pace which is always nicer with kids, especially in a city this size as sightseeing in LA can be overwhelming. And we loved the excitement of visiting LA with the girls for the first time and exploring the world of Hollywood with them. Kalyra, our eldest, has acting dreams so it was exciting to help fuel that dream for her! 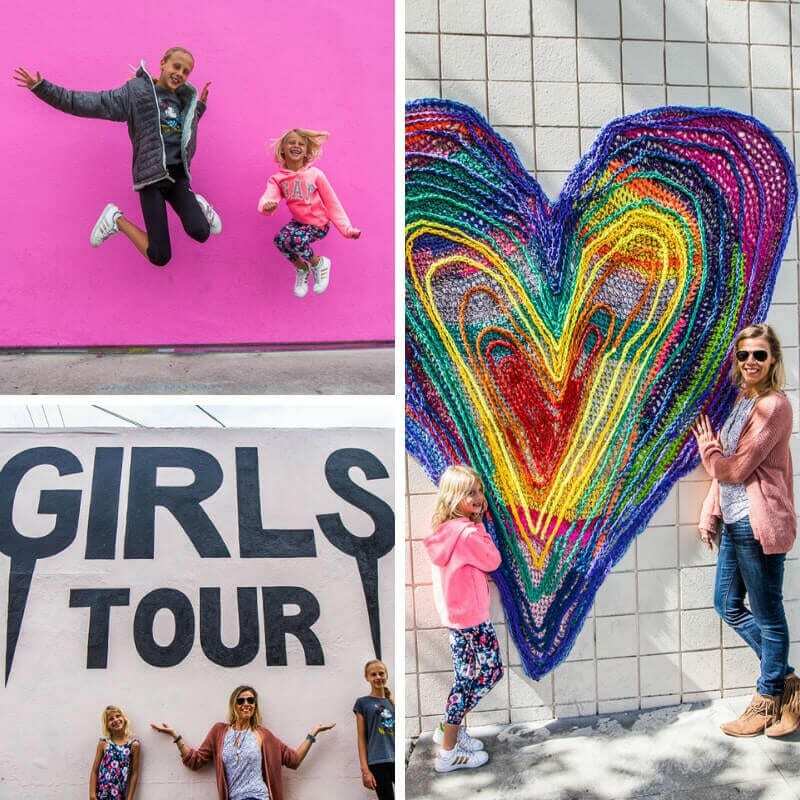 Below are our top recommendations on the best things to do in LA with kids, including where to stay, how to get around, ways to save money, and much more! This was a treat for our budding actress, Kalyra. The Warner Bros Studios tour was quite fascinating to see the behind the scenes of putting TV and movies together. But I hate to tell you this – it’s mostly all fake!! The backlot tour takes you through New York, Chicago, France and Connecticut. And any other place you can think of. It’s amazing how they can cleverly recreate any place on earth. The kids especially loved wearing the sorting hat in the Harry Potter archive section. Kalyra and Savannah got Gryffindor, I was Hufflepuff, and Craig was Slytherin. We also had fun holding a real OSCAR, and sitting on the Friends couch which was filmed here and not in New York City! And Savannah got to stand on the steps of her favorite TV show house, the Fuller House. Ellen is also filmed out here and The Big Bang Theory is in its last season. And even parts of Jurassic Park were filmed here. You can visit archive rooms to see costumes and props from Harry Potter and Batman films, You even get to try the sorting hat. It does come at a price though, and kids must be 8 years old or older. If you’re fascinated with the movie industry then you’ll find this tour worth it. If you’re tight on budget and nonplussed, I’d skip it. We all loved visiting Universal Studios in Orlando, especially the Wizarding World of Harry Potter, so were excited to see what Universal Studios Hollywood was like. Turns out the Hollywood park is not as big as Orlando, which makes it easy to do in a day and gives it a more relaxed vibe. So for a family friendly day of movies, rides and entertaining shows at one of the top LA tourist attractions, head to Universal Studios just north of Hollywood (over the hills!) You’ll appreciate the views over the valley from here. Don’t miss the backlot tour which takes you behind the scenes, and the Mummy ride is super fun. 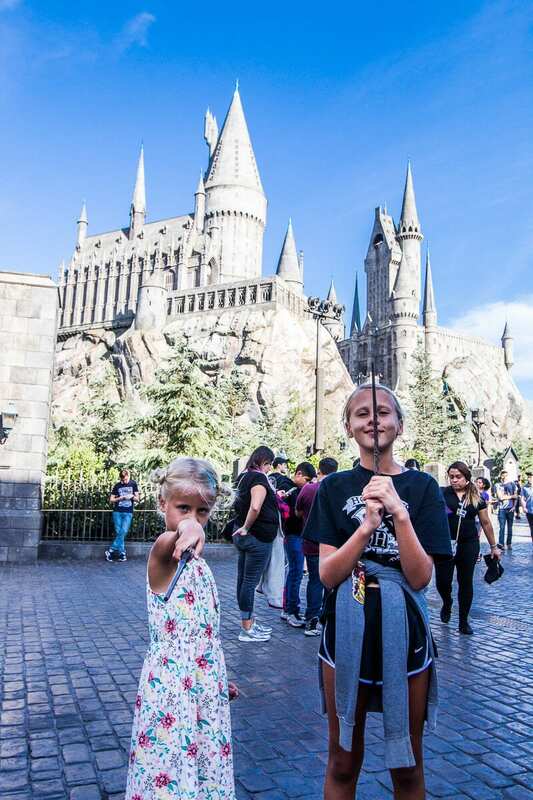 And of course, the Wizarding World of Harry Potter is one of the best things to do in Los Angeles with kids who are Potter fans! Sipping on a butterbeer and the Forbidden Journey ride were our two favorite things. Once you exit the park, Universal City Walk is a cool spot to explore and have dinner – we ate at the Hard Rock Cafe which is always a family favorite! Get your Universal Tickets here. 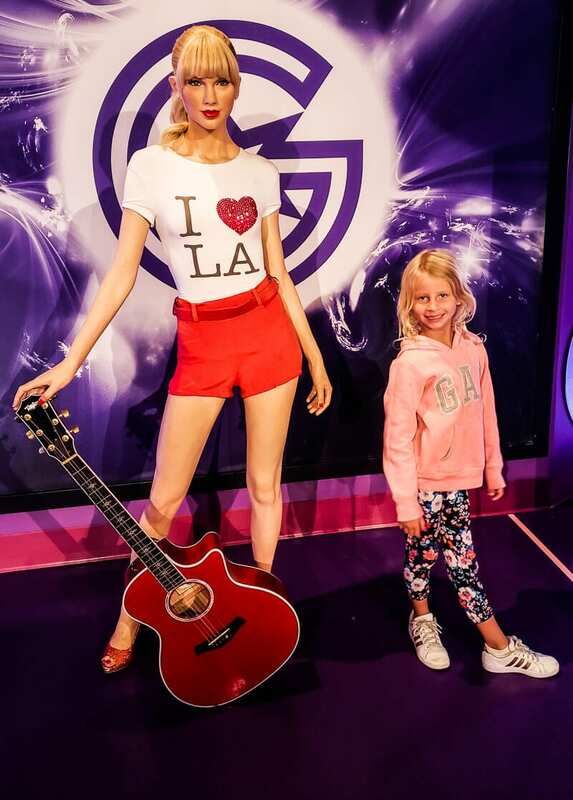 One of the most touristy things to do in LA with kids is the Hollywood Walk of Fame, and one of the LA attractions Kalyra was most looking forward too! She was excited to see and grab a photo with some of her idols stars embedded in the sidewalks along 15 blocks of Hollywood Boulevard. We did, however, visit a few days before the OSCARS Academy Awards show so there was lots of setting up going on with scaffolding for lighting and TV equipment which covered up a large section of the pavement. Unfortunately Kalyra missed seeing her fave star, Daniel Radcliffe, who was under the red carpet. Be warned there are people trying to sell you things, but they have cleaned this up since the last time we were here many years ago with permits required. But if you and your kids are into movies and Hollywood, go here once! This is a public sidewalk, and open 24 hours with no tickets to purchase. Also along the Hollywood Walk of Fame is one of the other top LA tourist attractions, the TCL Chinese Theatre. It’s where Hollywood’s biggest stars come to watch their movie premiers, and out the front of this theatre is where you see the cement hand and footprints of the who’s who of Hollywood. Stars only receive this special accolade if one of their films have been shown at the theater. Each star will leave behind something signature about them as well whether it’s a saying or a particular imprint. For example, the Harry Potter crew left imprints of their wands. Fortunately, the OSCAR construction crew didn’t cover up this area and Kalyra got to see her favorite Harry Potter stars embedded in the pavement. Can you believe this is the first time we’ve gone to a Madame Tussauds? We always felt it was a silly idea and a waste of money. But it was included on our LA Sightseeing Pass and we had an attraction spare so we went as our kids were begging us! We found it surprisingly quite fun, and liked how you could interact with the wax figures in various ways for photos. The girls really had a great time taking selfies with their favorites. It is amazing how life-like and realistic these wax versions are! 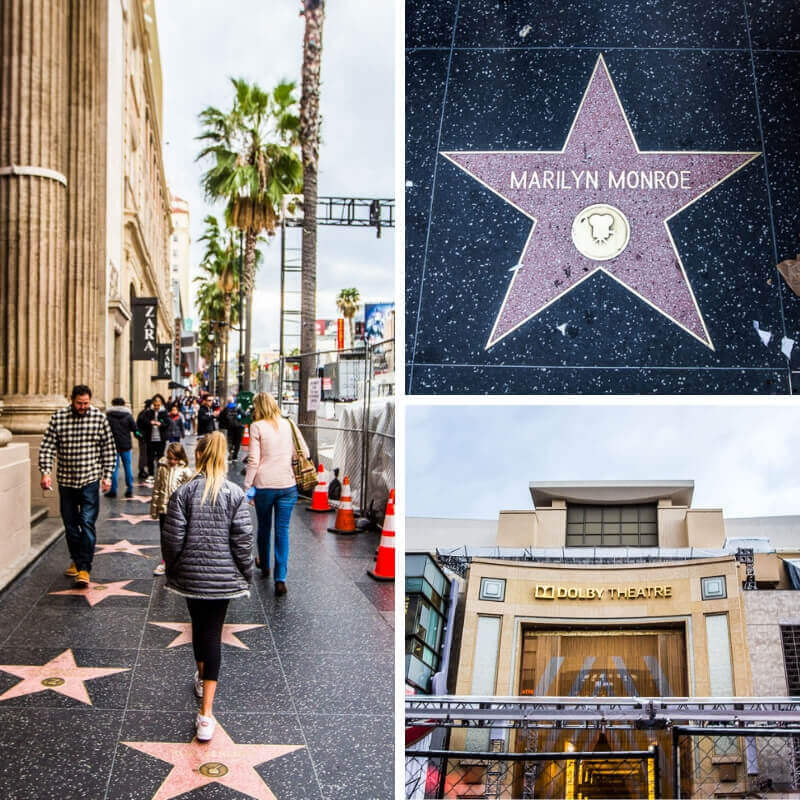 If you’re looking for even more things to do in Hollywood, consider doing this 75 minute behind the scenes walking tour. We’re doing more of these walking tours as you learn so many cool stories and a deeper history to a certain area. This one changed our opinion on Hollywood and gave it more meaning. Without it, it just would have just been a few stars with names on the sidewalk and some hand prints in the cement. 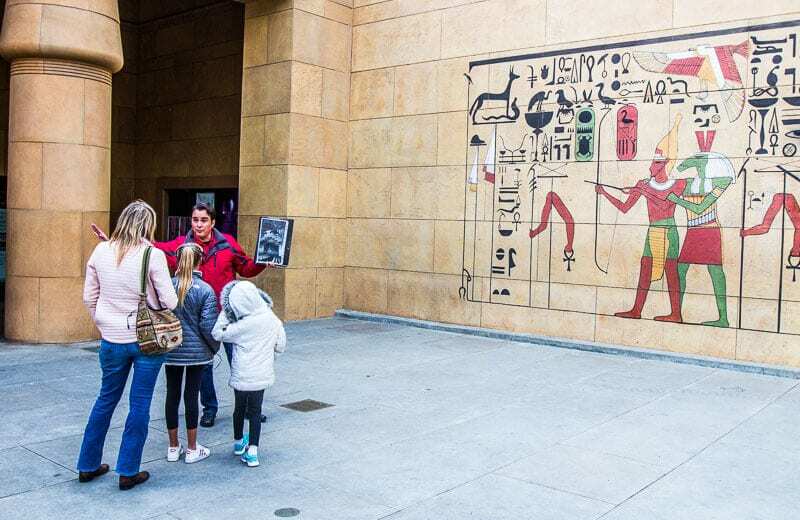 Because of this tour we learned of the traditions behind this and how the whole celebrity stardom thing happened – with one man’s dream to change the local Hollywood residents’ opinion of the actors and actresses who weren’t really anybody back at the time. Our guide was local from the area, and interacted with and kept our kids entertained. 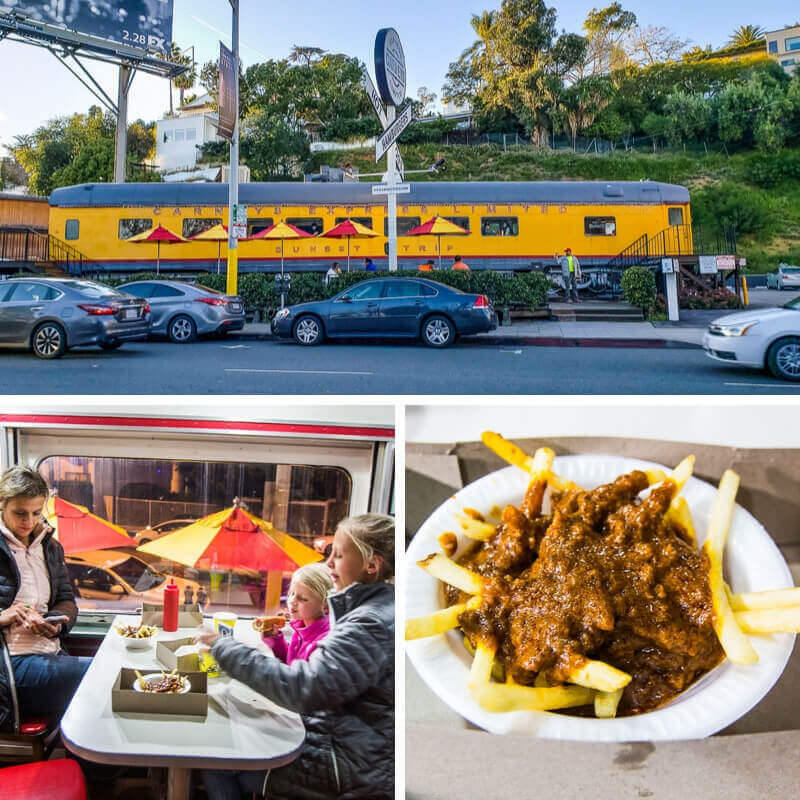 Sunset Blvd is famous mostly for adult experiences, but one of the fun things to do in Los Angeles with kids is eat at Carneys Restaurant, which is actually a train carriage you sit inside of. This is a LA landmark, and a family owned business that prides itself on serving some of the best hamburgers and hot dogs in Los Angeles. Our kids had fun and enjoyed their burger and hot dog, and don’t leave out the chili fries too! 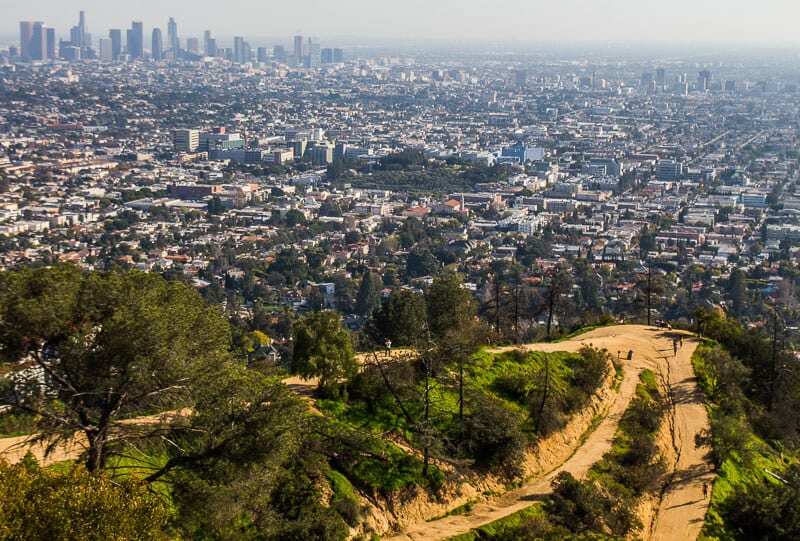 If you’re looking for stuff to do in LA away from the urban congestion and in nature, Griffith Park is one of the largest urban wilderness municipal parks in the US. 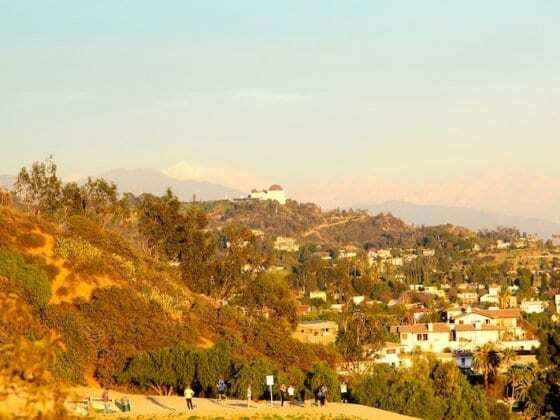 Located in the Santa Monica mountain range, it’s approximately a 20-minute drive north-west of Downtown and offers several hiking trails, deep canyons, pony rides, and stunning views over LA. If I lived in LA, I’d be hiking here all the time! We did the hike to the Mt Hollywood Summit, a 4 mile loop trail, which offered spectacular views of Downtown LA, the Griffith Observatory, Hollywood Hills and the Hollywood sign. We didn’t make it to the sign – it was much longer to get all the way there, so it’s going on our list of Los Angeles activities for next time! The LA Sightseeing Pass includes guided hikes out here if you did not want to do it yourself. It’s perfectly safe and enjoyable to do it solo as a family though! Griffith Park offers numerous LA attractions, including Griffith Observatory which sits perched on a hilltop below the Hollywood Sign. We had great views of this during our hike here, and then walked down and around the perimeter. Unfortunately it was closed as we visited on President’s Day. The observatory has public telescopes and star parties, and we’d like to go back, especially at night and do some star gazing and to see the Samuel Oschin Planetarium. So consider putting this on your list of things to do in LA at night with family. 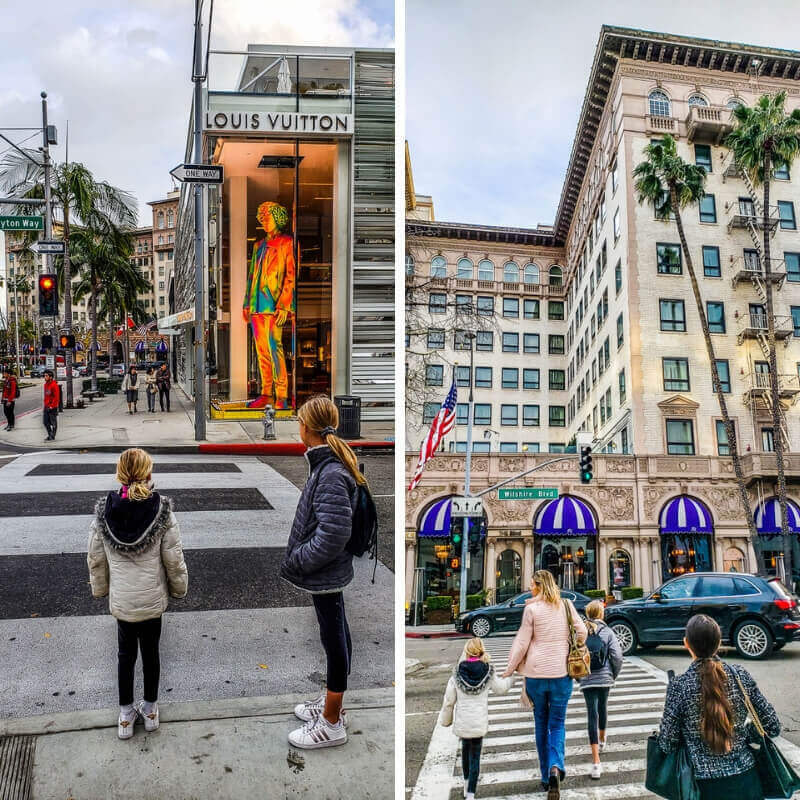 Probably more suitable as things to do in Los Angeles with teenagers, but another Los Angeles sightseeing activity Kalyra really wanted to do was visit Rodeo Drive. She followers a few YouTubers who frequent this street so wanted see all the glitz and glamour. And when you visit LA, this is definitely one of the places where it’s best to leave your credit cards at home – unless of course you have the means to spend like $750,000 for a designer suit at House of Bijan! We saw some of the most ridiculous and expensive clothes in Gucci. Each to their own of course, and when you have the $$$$ I guess you gotta stay cool. Our girls LOVED pretending to be rich and famous on this street. And why not pop into the Beverly Wiltshire Four Seasons for a sticky beak. We would loved to have sat at the bar having a cocktail. But, wasn’t sure how kid-friendly it was. Caz and I did one years ago pre-kids, and all I remember is seeing a lot of high gates and privacy walls. But, I found this one more interesting. And Kalyra was excited to see the homes of Katy Perry, Beyonce and Bruno Mars. Again, there were a lot of high gates but we still got glimpses of properties with okay views, and saw the round glass rental home Justin Bieber got kicked out of when his mate threw a party when he was out of town. It was nice sitting back of the open top van hearing the stories and taking in the beautiful Hollywood Hills and Mulholland Drive views. We were able to go into the exclusive neighborhood of Bel Air and help Kalyra’s dream of one day owning a house like Beyoncé’s and Jay Z’s $80 million dollar home. We also enjoyed driving along Mulholland Drive and looking out over the valleys and Beverly Hills gated communities. It helped us to appreciate LA more and get the allure of living in this city. Or it is included in the Sightseeing Pass which you can purchase here. Our girls loved this tour so don’t be afraid to take you kids. You can of course do it yourself. We had a blast exploring the art murals on Melrose Ave and taking photos. There are so many and they change all the time. We decided to do a walking tour which turned out to be one of the most fun things to do in LA. You could do it yourself, but we loved having a guide to take us to the best spots and even help us create cool poses. This is the area for those who love funk, edge, art murals, boutique shopping and loads more. You can just wander up and down here looking in the stores and taking selfies with the painted walls. The tour started by grabbing a cup of boutique coffee and then hitting the murals, learning more about the art and couture of hip Melrose Ave. The murals here are changing all the time so you can keep coming back. This is one of the most popular things to do in Los Angeles with kids. But, we’ve never been huge fans of Santa Monica Pier, or the Third Street Promenade, and our recent visit hasn’t changed our minds. We find the pier too busy, too tacky, with crappy food and rides. If you want rides, I suggest you go to Universal, or Six Flags, or Disneyland. And many people have since told us how underwhelming they found it too. But hey, if it’s your first time visiting LA, of course go see it once and decide for yourself. We did discover a cool brewery though, The Dudes Brewing Co. And on our next visit we’d like to explore the more local flavor of Santa Monica but we ran out of time with our bike ride to Venice Beach. 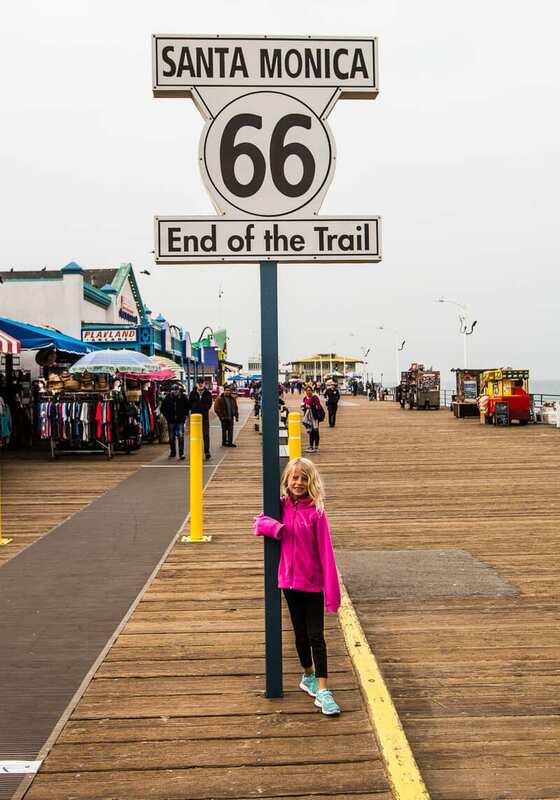 Put this on your list of fun things to do in LA with kids. You can rent bikes down by Santa Monica beach for around $7 an hour or $20 a day. You can also rent a bike here for $45 a day to explore all of LA. As we’re on a 1 year USA road trip we had our own. It’s an easy a 3 mile cycle along the boardwalk that’s filled with other cyclists, walkers, runners, and roller skaters, you name it. 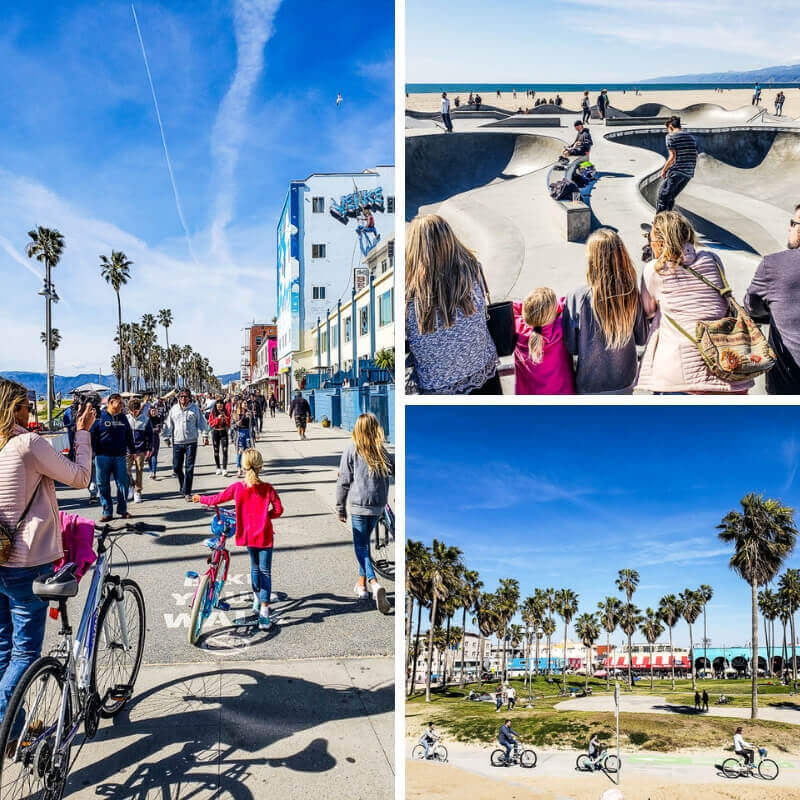 Venice Beach is one of the top things to do in LA for first time visitors. We enjoyed watching the skateboarders, basketball games, gymnasts, buskers and people watching. There was this young skateboarder, maybe 9 years old girl absolutely carving up the skate ramp when we last visited – our kids loved watching her. Venice is colorful and just eclectically cool. We kind of like it’s psychedelic ambiance that’s trapped in the hippy free love movement of the sixties. 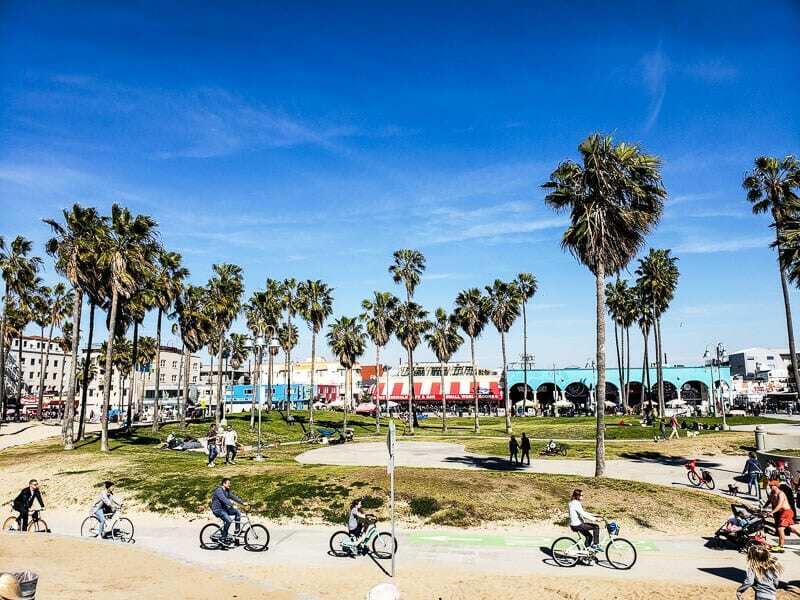 If you’re looking for colorful LA experiences, then Venice Beach is the place for you. There is a nice sized boardwalk filled with shops and a few restaurants/cafes, colorful murals and the odd busker and artist selling their wares. And the people watching is first class! Be prepared for whiffs of marijuana though, it’s legal in California, and the homelessness, so maybe prepare your kids for that. Again, when you visit LA for the first time, Venice is one of those places to experience at least once. We tell all of our Australian (and international readers) to head to the South Bay beaches of Manhattan and Hermosa, which are not far from LAX. 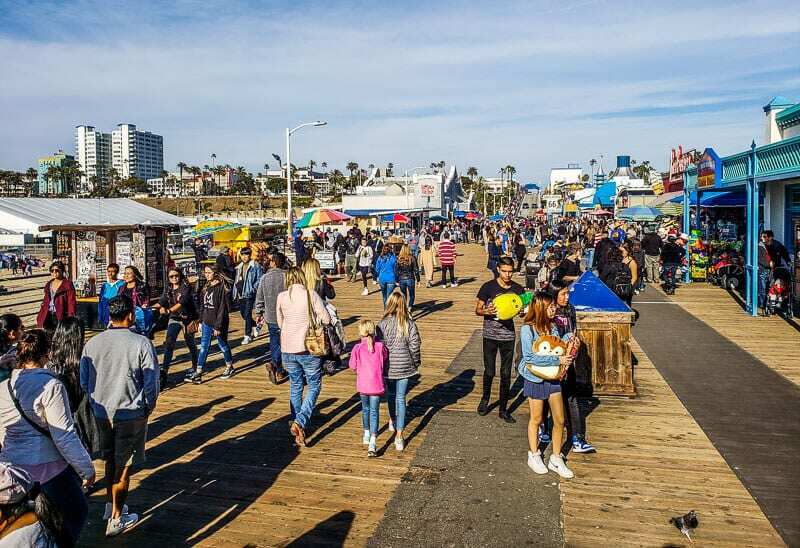 These beach towns are two of the best places in Los Angeles that offer a local vibe and feel, especially compared to the over touristy Santa Monica, and Venice. 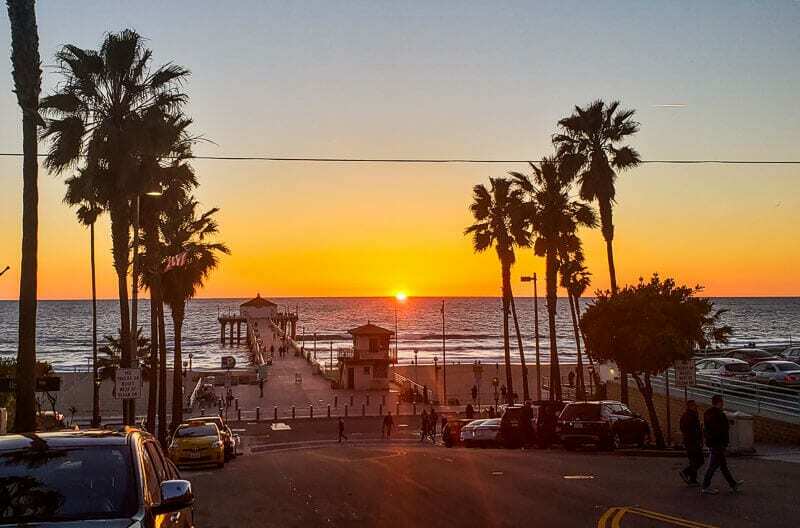 If you enjoy beach volleyball, then Manhattan Beach and Hermosa are the best places to visit in Los Angeles to have a friendly game. In fact, they call Manhattan Beach the Volleyball Capital of the World. 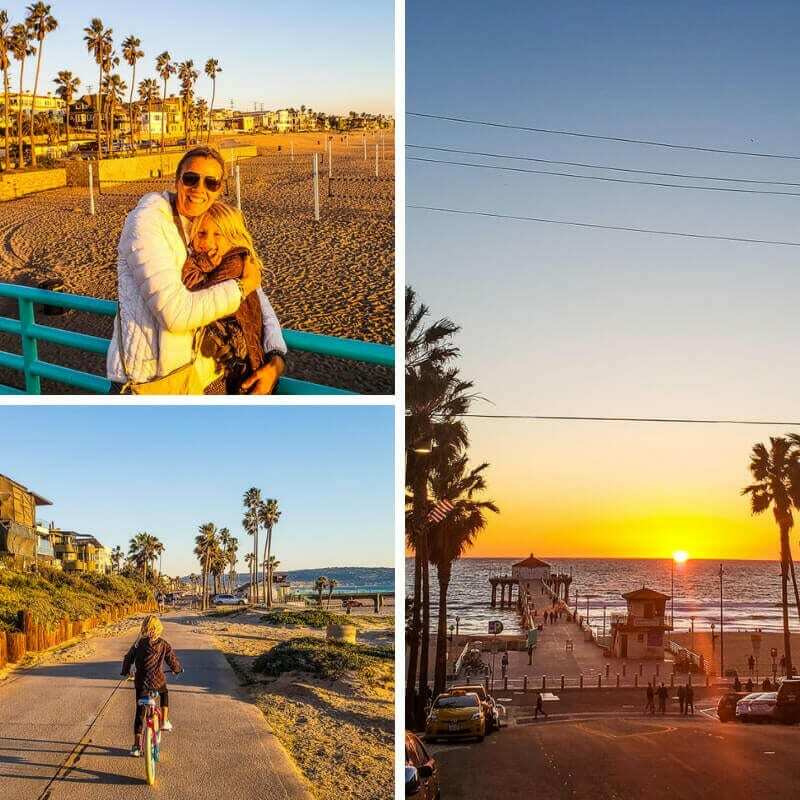 We love to ride along the beach promenade between Manhattan Pier and Hermosa Pier (you can even go further: north to Marina Del Rey and South to Redondo Beach). California wins with epic sunsets. Of course, you get to watch it dip below the ocean horizon. We loved our evening sunset bike ride from El Segundo to Manhattan and watching the sunset. The sunsets on the beaches are worth the trip alone. Make sure you stop for a sundowner at one of the many beer gardens along the promenade. And be sure to grab some ice creams for the kids! 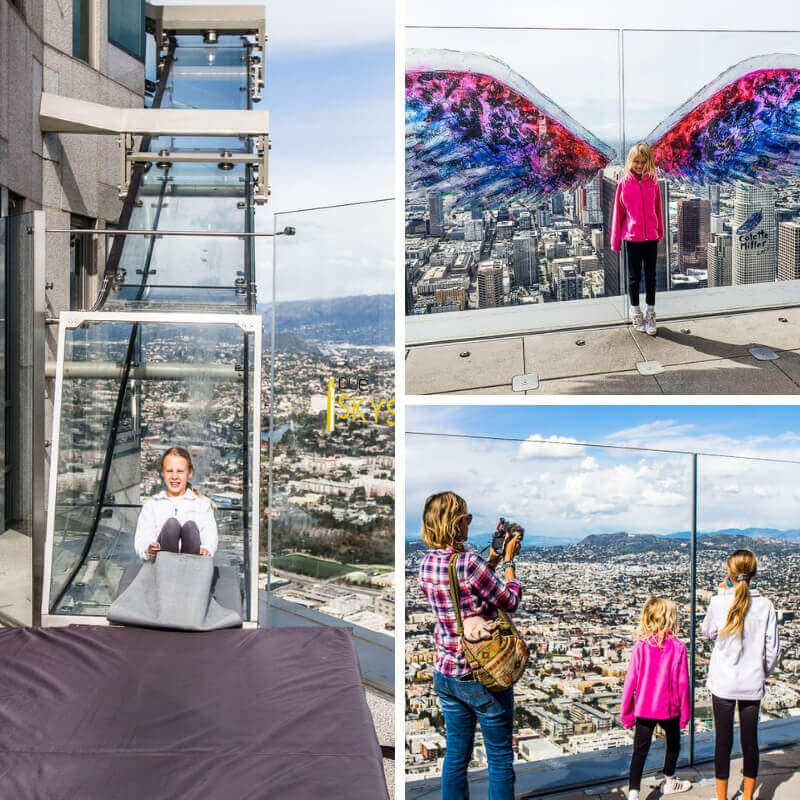 Are you and your kids brave enough to slide from the 70th floor to the 60th floor of California’s tallest building on a see through glass slide? All four of us did this no problem, but a lady in front of us hesitated forever and then screamed the city down! The slide is over within seconds and you barely notice you’re held up by a piece of glass hanging off the side of a building. I promise it’s not that scary. It is a little expensive though. But the Oue Skyspace in Downtown LA is a unique experience and worth doing if your budget is not too tight. 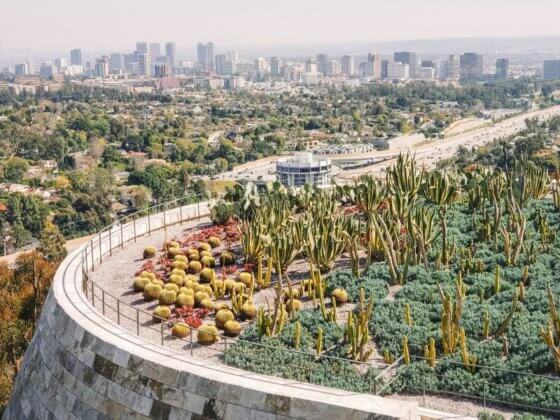 It offers 360-degree panoramic views of LA, with some interesting and fun displays on show. We almost had the OUE Skyspace to ourselves. If that was in Chicago or New York City, you’d be lining up for hours! So if you find yourself in downtown LA, put this on your list of things to do in Los Angeles with kids. And thankfully, it’s included in the Los Angeles Sightseeing Pass. 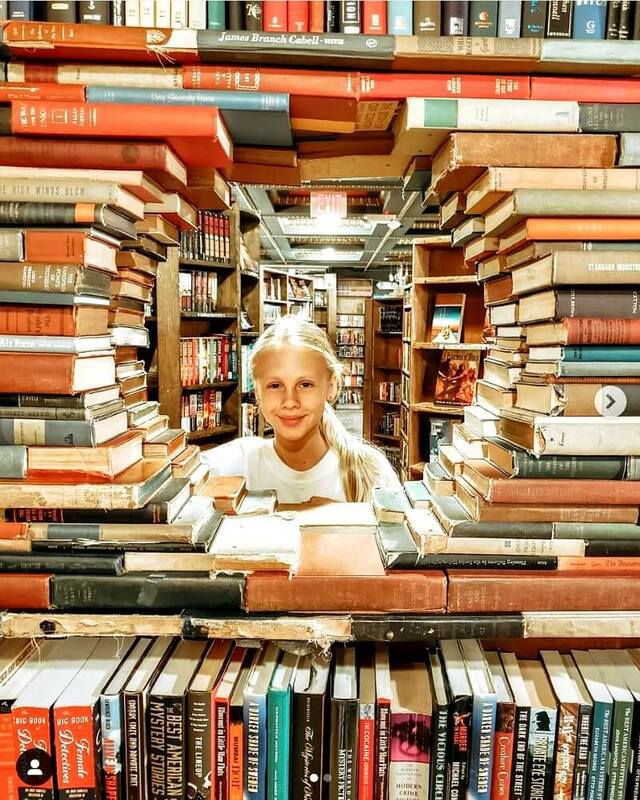 If any of you in your family are book lovers, one of the cool things to do in downtown LA is visit The Last Bookstore. It’s a very cool space to browse, read, buy books and check out quirky book sculptures, and get some fun photos. Also in Downtown LA, and across the road from Grand Central Markets (which is a cool spot to eat or wander through by the way), is a bright orange archway leading to the world’s shortest railway at 298 feet. 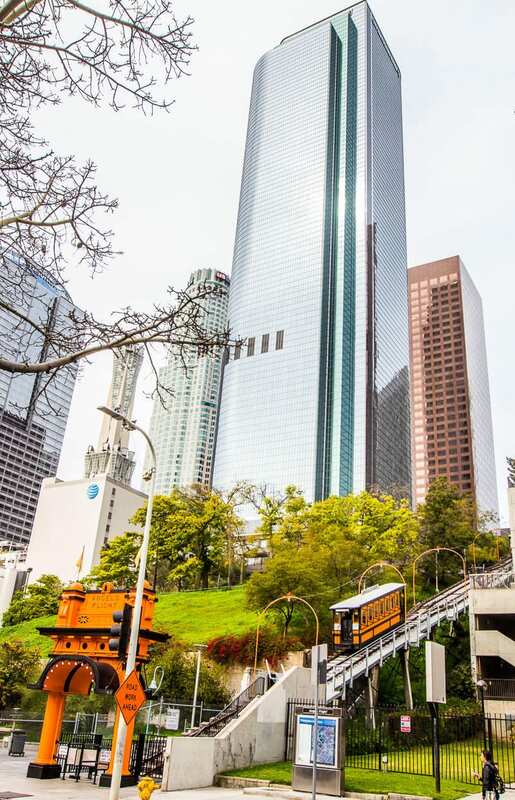 Angels Flight Railway is a quirky historical landmark and was originally built (in a nearby location) to carry residents of the luxe homes on Bunker Hill to their jobs in downtown. By the 1950s, it had carried more than 100 million passengers. Open daily, 365 days a year, and only costs $1 each way. 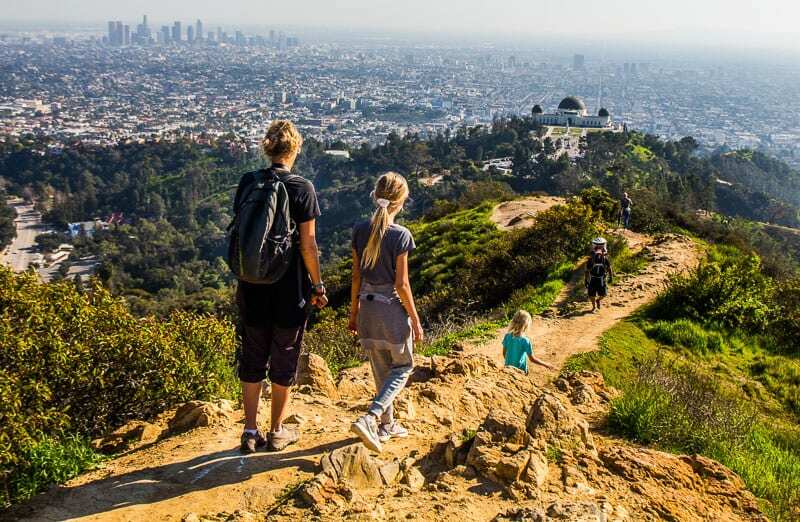 For more hiking adventures in LA, we headed to Runyon Canyon, which is one of the most accessible hikes as it backs onto Mulholland Drive on one end and West Hollywood on the other. This also makes it one of the busiest, since it’s a small hiking area and popular with locals. There are plenty of paved trails winding up and down the hills filled with runners, walkers and dogs. 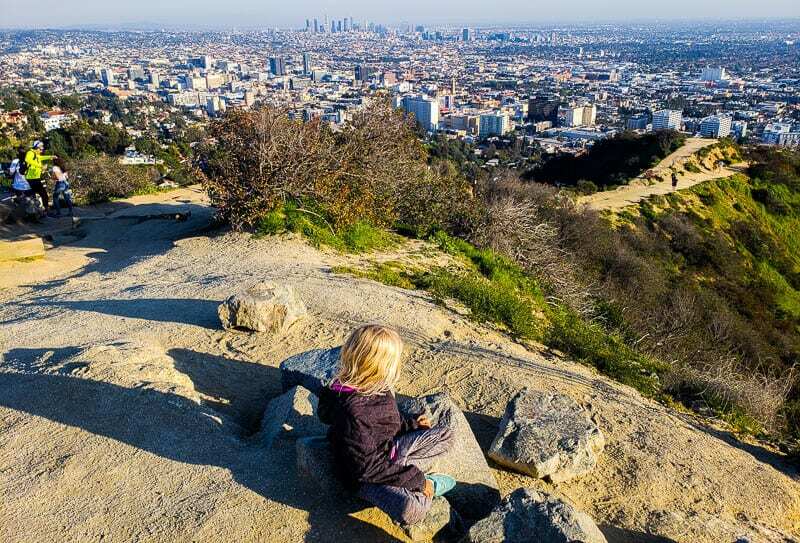 This short hike offered more stunning views of the Hollywood Hills and Downtown LA. We came from the Mulholland Drive section and walked to a couple of different viewpoints spending time to spy on Katy Perry’s swimming pool (we knew which one was her house thanks to our Celebrity homes tour). 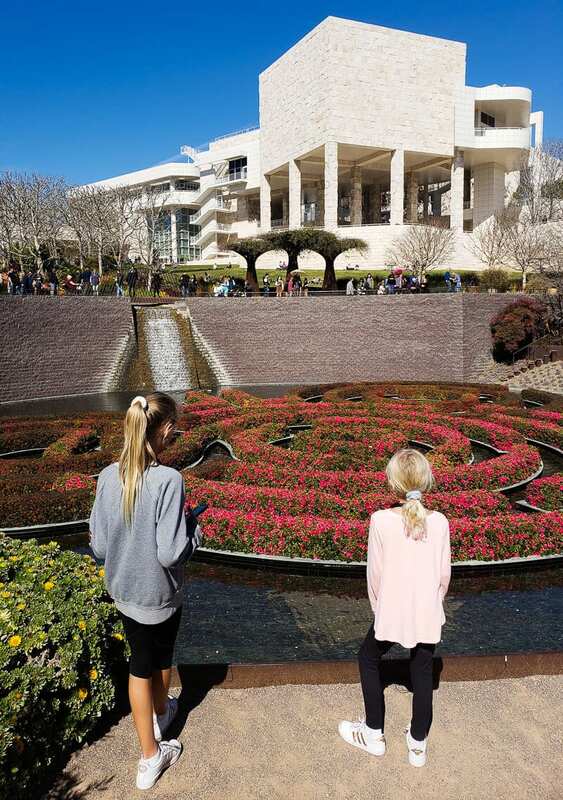 The Getty Museum is one of the popular free things to do in Los Angeles with kids (you have to pay $15 for parking). We’re not big art or museum people so found this a little boring, but most art lovers will rave about it. The Getty Center sits atop a hill in Brentwood, and is reached via a three car cable pulled tram from the bottom car park. The museum specializes in artworks, but way more interesting to us was the architecture of the building, the views and the beautiful sculptured gardens that surround the museum. So if you’re not a big art lover like us, and you have a few spare hours it’s worth a visit. It’s a great museum for kids if they love art. If you plan on doing a few attractions in LA, consider purchasing a Sightseeing Pass. It is a city discount card which will save you money on several big name attractions, including several we listed above. We use them in all major cities we visit (See New York and New Orleans) and work as affiliate partners with The Sightseeing Card and they provided us with LA passes. An alternative is the Go Los Angeles Attraction Card. 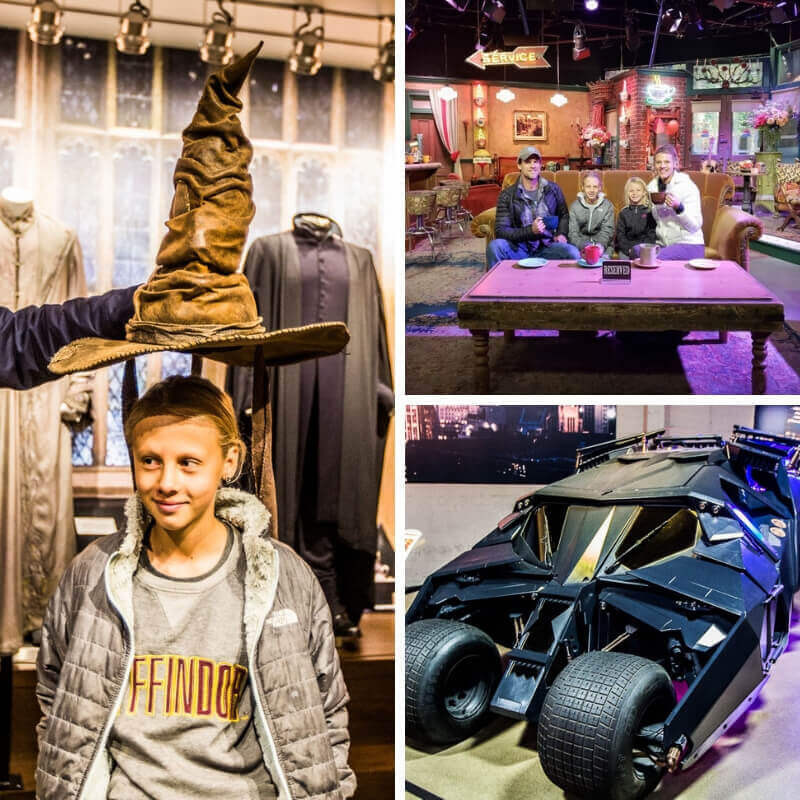 Save up to 50% off retail prices on admission to over 30 top attractions and tours including Universal Studios Hollywood, Madame Tussauds and more. If you are visiting multiple cities in the USA, a USA Sightseeing Pass may work better for you. Parking in LA was not as bad as I was anticipating. Other cities in the US will charge more. Down on the beach in Santa Monica down you can find parking in their beach lots for $7- 10 a day. You can ride the metro to most places in LA. You can even make connections that will take you as far as Santa Barbara and San Diego, and with traffic, it may be a far better option. You can use the Metro’s itinerary planner to help you map your routes. We did not experience the metro on our last trip, but we had many years previous. 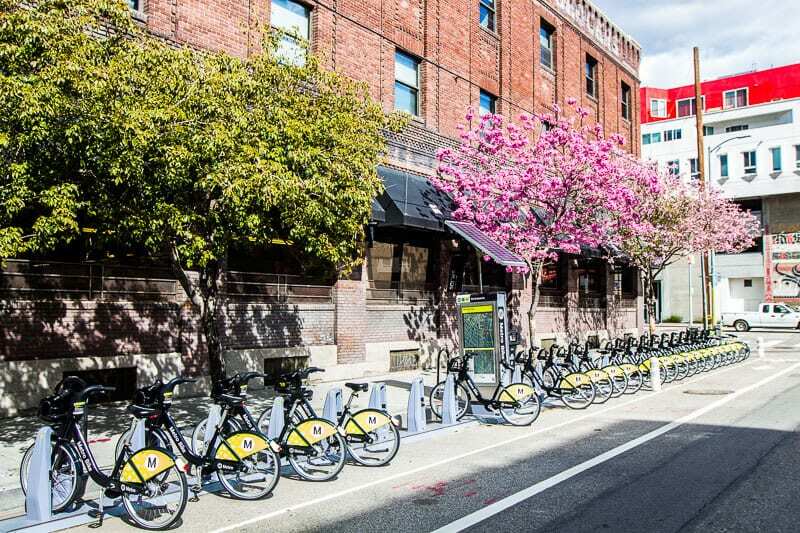 There are Metro Bike Shares located all over the city and outside many Metro Stops. It’s available 24/7 and costs $1.75 per 30 minutes. You can also purchase a day pass ($5 for unlimited trips free trips for 30 minutes or less. That means every 30 minutes you have to check your b bike in and swap it with another. It will cost $1.75 per 30 minutes you go over the 30 minute free trip limit. You can rent bikes down by Santa Monica beach for around $7 an hour or $20 a day. You can also rent a bike here for $45 a day to explore all of LA. The scooter sharing programs are now popular and can be found all over the city. RentalCars.com is the world’s biggest car rental booking service that compares all the major brands like Hertz, Avis, Alamo, and Europcar. You may want to rent a car if you want to visit beyond Los Angeles, like the scenic coastal drive to San Pedro, or as far as San Deigo. Our partner, the Get Your Guide tour company offers many LA tours and attractions. They have lowest prices, guaranteed — no booking fees or hidden charges. You can pre-book tickets and skip the line at top attractions and cancel up to 24 hours before. See what LA tours are available here. Being a travel town, there are endless choices for places to stay in LA. Consider length of stay, which areas you’ll spend more time in, ease of access, amenities and budget. The Garland Located in North Hollywood near Universal Studios it offers retro cool rooms on a seven acre shaded property. Hilton Los Angeles – One block from Universal (with free shuttles) and a short trip to Hollywood, this is a great family hotel option. Kimpton Hotel Wilshire – a sleek boutique hotel located near Beverly Hills, The Grove and LACMA. Rooftop pool and views await. We stayed at a Kimpton in Huntington Beach which we loved! Hotel Bel-Air – Located in a tranquil wooded hills setting, this exclusive luxury accommodation will give you a taste of the celebrity life. The NoMad Hotel Los Angeles Downtown LA’s historic Giannini Building, the NoMad Los Angeles features several on-site dining options and a rooftop pool. The Ace Hotel – this hotel in the historic United Artists Building gets my vote. I especially LOVE the rooftop pool and sunset views. Hermosa Hotel – 0.8 of a mile from Hermosa beach offers spacious rooms, heated pool and not tub year round. I have planned my trip to Los Angeles and was searching for a couple of things from a long time. This list is really impressive and now I have a list of things to do in my Travel plan. I’ll surely love to watch all of these for sure. Love this post! Universal Studios Hollywood and Venice beach are my favorite places to go with kids.